Where I am going next? Looking at a road map of the French Alps it really is difficult to decide where to go and where to miss out. It is quite easy to pick out a spectacular route but it’s also very easy to simply not have the time to cover everything you’d like to see. 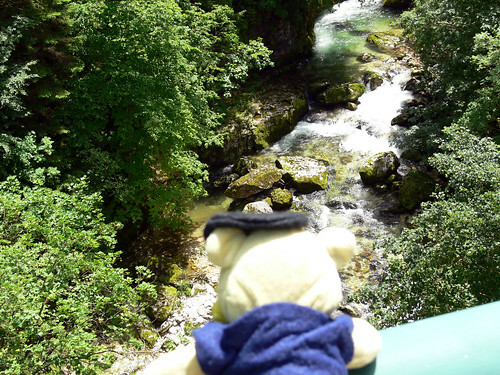 After two days of sightseeing around Lake Annecy, mainly on foot, we had decided to spend this day in the car and pick out a loop taking in some of the amazing gorges, towns and mountain passes that the area has to offer. 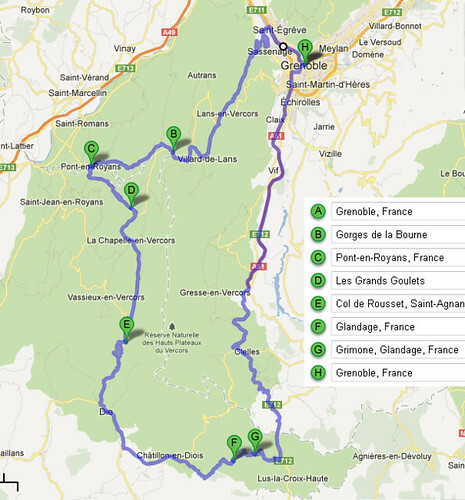 This is the route we planned around the Vercors Regional Natural Park (it doesn’t show getting to and from Grenoble from Saint Jorioz). 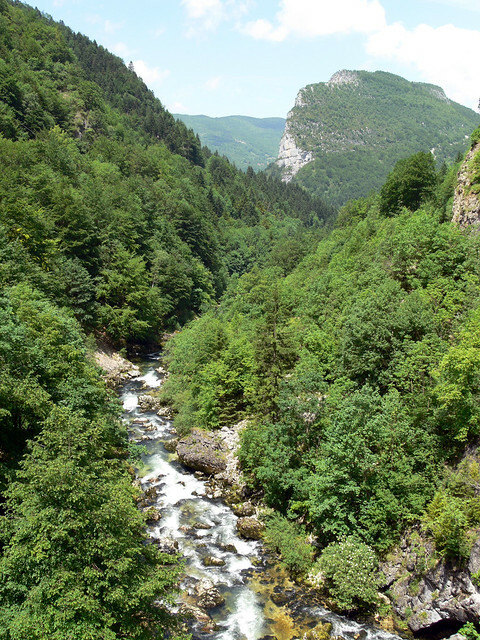 Google Maps says the round trip from Grenoble should take just over 4 hours; the round trip from Saint Jorioz is estimated at just under 7 hours. If you include time taken to stop and walk about and take pictures you need to be out really early in the morning. 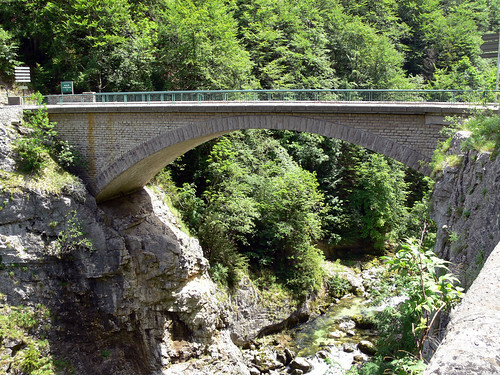 The route takes in the amazing Gorges de la Bourne, the Pont de Goule Noire which spans the gorge, the town of Pont en Royans with its hanging houses, the spectacular views at Col de Roussett, the really quite beautiful Gorges des Gats and the city of Grenoble. 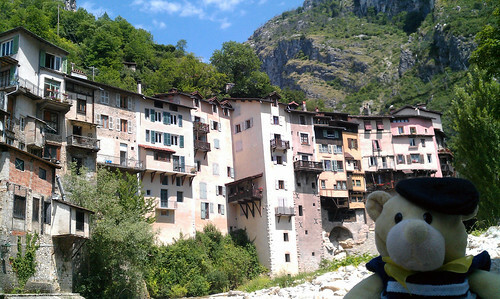 We had planned to visit the caves of Choranche before reaching Pont en Royans but had to abandon the visit due to time getting on. 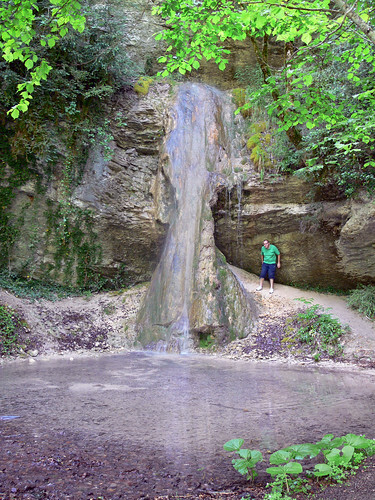 If you imagine the Gorges de la Bourne weaving between the cliffs behind me in the picture above you will get an idea of how spectacular they are. Unfortunately it is almost impossible to find a safe place en route to park a car for a moment to take photographs so I will have to rely on the people over at the Alpine Roads website and show you some of their pictures (much easier to park a motorbike). There is a 3.5metre height restriction on a very long section of the road because the rocks actually overhang so far in many places and some canopies have been constructed where rockfall occurs. Much of the D531 road is breathtaking and a must-do if you’re in the area. If you are thinking of going anytime outside the height of summer try and find out if any road closures are operating – they do a lot of work to the roads outside the main tourist season. This was the first opportunity to park the car safely so we hopped out and took a look around the bridge that spans the gorge here. The view from the bridge is stunning. 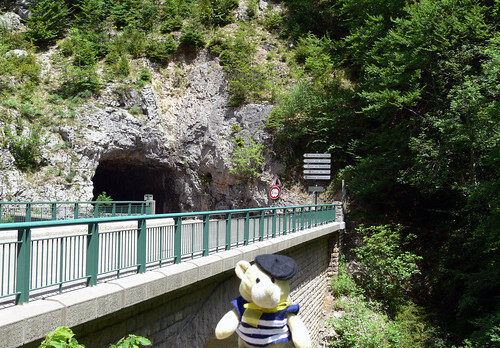 We drove across the bridge and through the tunnel towards our next stop, Pont en Royans. 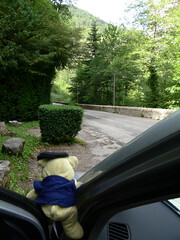 You can continue straight on without crossing the bridge directly to the Col de Roussett should you wish. 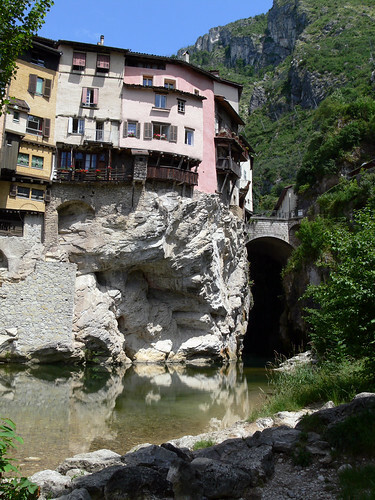 There are few places to park right in Pont en Royans and if you want to get the best view of the hanging houses you will want to be at water level a little further down river anyway. From the photo below, if you continue on the road you can see going straight ahead (not across the bridge to the right and into town) after a minute or so you will come across a ridiculously tight turning on your right hand side which takes you down a narrow ramp where you will find a large carpark on your left. We couldn’t see anywhere to pay so I think it might be free? From there it’s a two-minute walk to the river where there’s lots of picnic tables and a play area for children (but not really for bears). You can also cross the river back to town. I’m not too sure how much I would want to stand on one of those balconies to be quite frank. But it really is very pretty, and quite dramatic with the mountains behind. 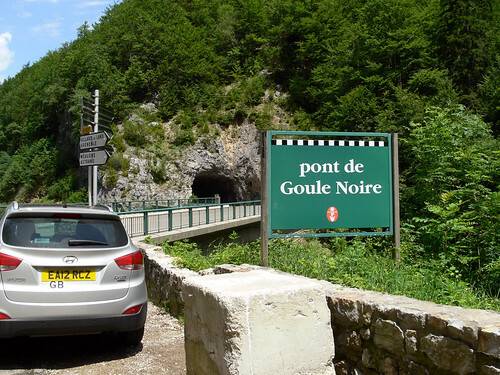 The next part of our journey took us along the D518 from Pont en Royans down towards the Col de Rousset via the Grands Goulets tunnel and the towns of La Chapelle and Saint Aignan en Vercors. 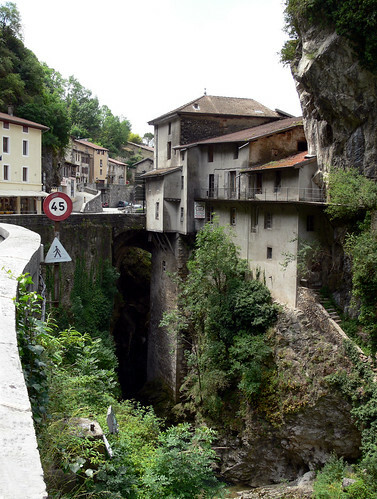 We had seen amazing pictures of the tunnels on Les Grand Goulets (just by the village of Les Baraques en Vercors) but sadly I believe the road has fallen into serious disrepair and is now closed, having been replaced a few years ago by the tunnel through the mountain. 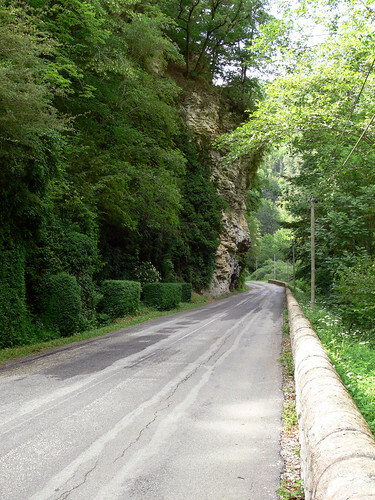 After the Grands Goulets tunnel the road opens up into a wide valley which eventually starts making it’s way back uphill again towards the Col de Rousset. 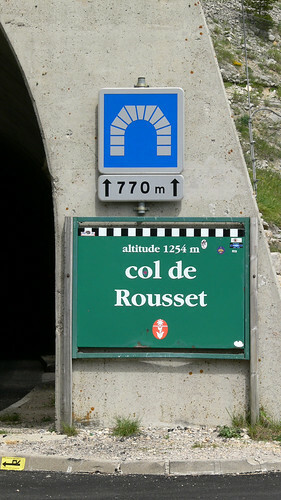 When you reach the Col de Rousset tunnel look out for the exit out onto the viewpoint as you really don’t want to miss it. If it’s a clear day you really are in for a treat. On our way down the road and round all the hairpin bends there are 2 kinds of cyclists; the ones going downhill that look like they’re having great fun, and the one’s going uphill who look like they, well, aren’t. There’s lots of grimacing cyclists all over this part of France. Every time we passed them on the way uphill I wanted to open the window and shout encouraging things at them …but I suspect the sight of a small yellow bear cheering them on is more likely to have them fall off their bike to be honest so I kept quiet. The view from the Col de Rousset viewpoint at 1254m. So onwards we go and we continue down the road to the town of Die and then take the D93, then the D539 towards the Col de Grimone. The D539 is stunning and some kind (or mad) person has cut box hedge periodically ALL the way along. It must take them days! 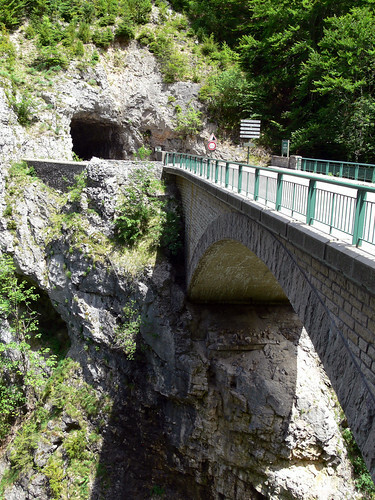 As you near the village of Glandage the gorge becomes much narrower (and prettier) until you find yourself going through a small section of more tunnels and canopies. 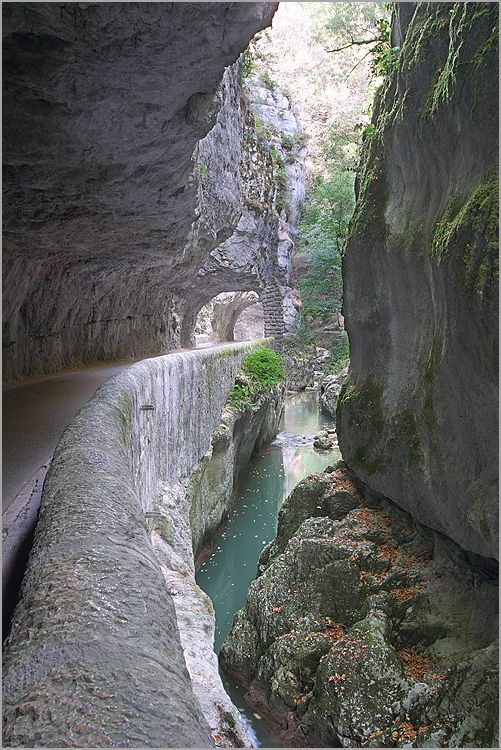 I don’t recall seeing any height restriction signs but the road through the Gorges de Gats with the overhanging rocks and narrow tunnels seem much tighter than than the earlier Gorges de la Bourne. 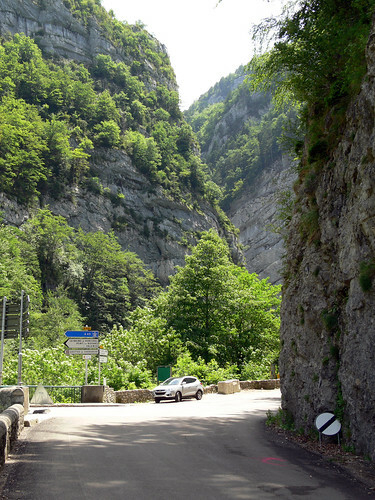 Suddenly you exit the last tunnel and the road opens out again and takes a long, steady climb towards the Col de Grimone (1318 metres). After the Col de Grimone it was more or less main roads up to the A51 back towards Grenoble and then Annecy and as such we didn’t take too many pictures as time was getting on and we had a long drive back to the campsite. 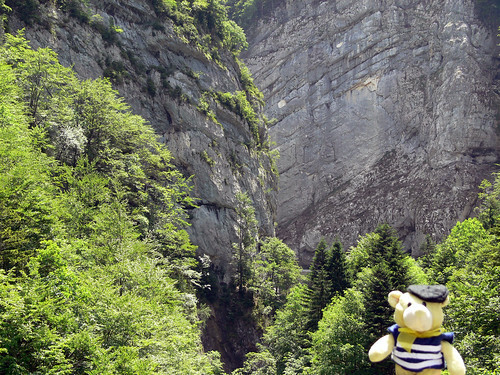 I hope you enjoyed the drive around the Vercors region with me. If you like my blog and want to keep in touch, click the button to follow me and receive notifications of new posts by email.